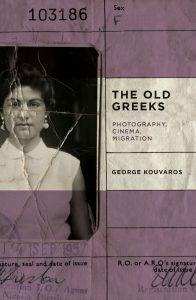 The Old Greeks: Photography, Cinema, Migration. This book brings together several strands of Kouvaros’ research and writing. He has written a number of important books and essays that examine the work of artists as diverse as Paul Schrader, John Cassavetes, Wim Wenders and Robert Frank. He has shown particular interest in work that takes place at the nexus of cinema, photography and performance. For example, in the book Famous Faces Not Yet Themselves: The Misfits and Icons of Postwar America (2010) he looked at the work of the Magnum photographers such as Henri Cartier-Bresson and Eve Arnold that was taken on the set of The Misfits (Huston, 1961) exploring ideas about performance and film acting and shifting changes in the Hollywood studio system. In Awakening the Eye: Robert Frank’s American Cinema (2015) he examined Frank’s photography, films and videos and some of the ways in which Frank used these different media to find new forms of visual expression. A broad tapestry of theorists, artists, writers and thinkers including Nikos Papastergiadis, John Berger, Edward Said, Marcel Proust, Roland Barthes, Elizabeth Gertsakis, V.S.Naipaul, Walter Benjamin, Siegfried Kracauer, George Seferis and Italo Calvino, to name just a few, provide a critical, aesthetic and autobiographical framework for Kouvaros’ own intricately observed and poetically evoked migrant stories. At the heart of this study is Kouvaros’ own mother. The book begins with his description of a Government of Cyprus identity card from 1957 that features a black and white photograph of his mother. This identity card is on the cover of the book, and this particular image of his mother frames and permeates the study in a number of ways. It is an affecting image, a record of a particular moment in her life, but it is also a document of a social world that was changing, a treasured fading document passed down to the next generation, as well as being a focus for many of the reflections and investigations that follow. Kouvaros’ engaged study of this image of his mother is an obvious reference to Roland Barthes’ reflections on the photographs of his own mother in his book Camera Lucida and Kouvaros thoughtfully follows on from Barthes’ questions about what a photograph can mean and the mnemonic power of simple snapshots. Vernacular photography is central to Kouvaros’ observations about the experience and memory of migration. Most of the photographs that are discussed in the book, and a selection which are reproduced, are staged portraits or documents of family gatherings. Kouvaros makes the important point that there was a key historical convergence between the rise of postwar migration and the increasing availability of cameras, film stock and printing facilities. He writes that, “the process of postwar migration occurred at the same time as photography shifted from the domain of the dedicated hobbyist to a universally available medium for recording everyday life.” (P. 25) He describes the suitcases of departing migrants in which carefully chosen photographs were an essential part of the personal belongings that accompanied people on their journeys to new lands. He also discusses the way that these photographs from the homeland became part of a larger narrative, when photographs from the new life, documenting new places and commemorating various events and celebrations, were sent back home “inside airmail envelopes” (p.26), building an archive of image memories that formed ongoing connections between the past and the present. While photographs provided a map, a toolbox, and a process of memorialization for the postwar immigrant, the cinema provided another kind of map. Kouvaros’ discussion of the connections between cinema and migration are interestingly diverse and intersect with his observations about photography. He describes how films were watched – in theatres as well as in church halls – as well as the kinds of films that were watched, and the various meanings drawn from, and attributed to, them. He explores an eclectic range of films with individual chapters on the independent films of the Greek-Australian filmmakers Anna Kannava and John Conomos, a chapter on the film about homecoming, Reconstruction (1970), by the arthouse Greek filmmaker Theo Angelopolous, and a chapter on the Hollywood film A Place in the Sun (Stevens, 1951). The two chapters on the films of Anna Kannava and John Conomos provide several key insights into the artistic practice of these two experimental filmmakers but focus, in particular, on their films about the migrant experience. Kouvaros finds echoes of his own memories of returning to his homeland in Kannava’s film Ten Years After….Ten Years Older (1986), and discusses a number of ways that the bridging of the past and the present of the migrant experience informs her film The Butler (1997). With his discussion of the multimedia work of Conomos, focusing in detail on the video Autumn Song (1996) and the video installation Album Leaves (1999), he finds the continuing connections between cinema, memory and reflections on migration. The Old Greeks: Photography, Cinema, Migration includes a number of photographs but I would have loved to have seen more, which is further testament to Kouvaros’ evocative writing style, one that creates desire for the images that he describes. Perhaps there could be another project – an extended image archive of remembrance – that would be another kind of book? There was one photograph in this book that particularly moved me. It is the ‘lost photo’ of Kouvaros’ mother walking in the streets of downtown Johannesburg, wearing a striking checked coat, appearing to look at her own reflection in a shop window. It is a photo taken on the street by a photographer unknown to her who found her and gave it to her the following day. It reminded me of a photograph that I have of my mother, who was an immigrant recently arrived from Eastern Europe in the early 1950s, walking in a Melbourne city street, also captured by a street photographer. And that is one of the resonant gifts of this book, that it tells a personal story of migration and, in its telling, connects to other stories of migration that are part of the fabric of our culture. As Kouvaros himself says, “Details of our departures and arrivals are entirely our own, but they also link our history to the histories of others.” (p.108) This is one of many, very good reasons to read this book.